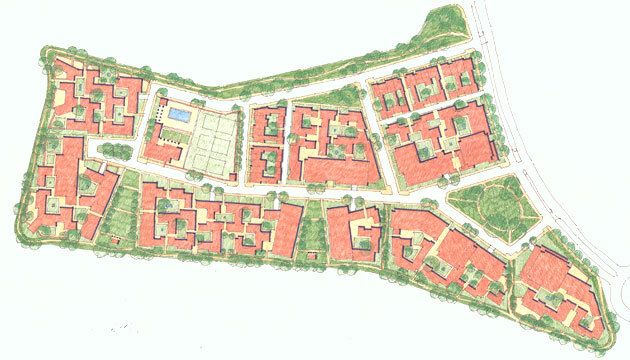 This design proposes the formation of a New Urbanist neighborhood within one of the islands of the golf course of the Santa Maria project. 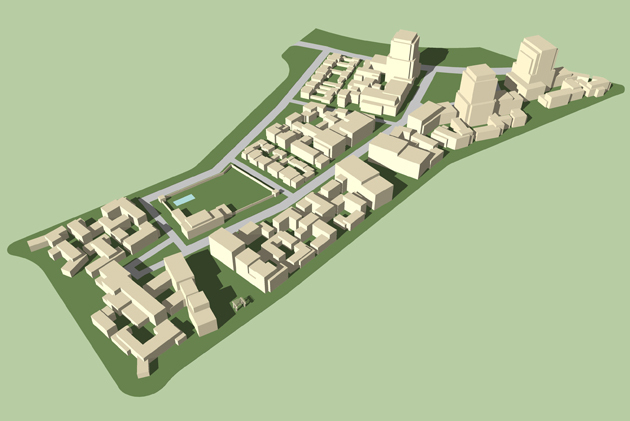 With 600 units and adjacency to the mixed-use town center, Santa Maria Neighborhood is an exemplary arrangement of residential buildings of many types attached to a network of slow streets and verdant parks. The project is surrounded by an edge road and linear park that include provisions for biking, jogging and walking, and is anchored by a club house and sports facilities for swimming, exercise and tennis. Its variety of building types and unit types accommodate residents across a wide swath of the social spectrum. Walkable, secure and amenity-rich, Santa Maria Neighborhood provides beautiful, unique dwellings, along with a sense of community created by the rich public realm of open space that surrounds all buildings.